I have listed a number of crafts for kids below that focus on the positive. One of my favorite things about growing up was doing crafts with my Mom. The creative expression of doing a craft is a wonderful way to incorporate affirmations into your child’s life. Discuss with your child either what he or she is grateful for or what they enjoy in life. I would avoid having them create a board of wants and instead focus on what they already have and enjoy. They can use the magazines to find pictures that they are drawn to, they can color pictures of their family or school or pet, they can cut out the fun activities they enjoy using the craft paper. With the glue stick affix the images they cut out and create to decorate their poster board. Have them write (or assist them in writing) their name at the top of their gratitude board. Have your child pick their favorite positive word. 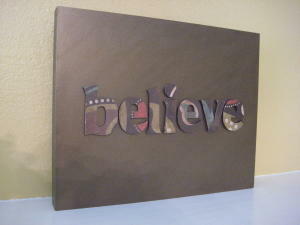 Purchase the individual letter of the word at your local craft store or you can go to: www.craftcuts.com. Wooden letters come in a variety of sizes and depths. If your letters do not stand on their own, you may want to pick up a piece of wood to attach your word to that will allow it to stand; the background wood can be painted to coordinate with your child’s creation. Give your child free reign to decorate their word as they choose. They can glue decorative paper, use glitter or paint to create their designs. Have your child pick or create their favorite affirmation. Write out the affirmation on craft paper or print it off your computer to fit the 5x7 frame. Let your child decorate the frame as they choose. Frame the affirmation and place it where your child will see it frequently. Crayons, colored pencils, craft paints or colored markers. In a different exercise for an older child that can write letters, have them write all of their favorite positive words in different colors and styles. Drawing can be a wonderful tool to assist your child in processing their negative feelings also. When your child is feeling sad or angry ask them to draw a picture of what that emotion looks and feels like. This will put a face or image to what is going on within your child to help them understand and process their feelings. It is also important that your child know that the negative feeling is not their identity, but rather a temporary state that is going on within them. Drawing an image separate from them will assist with the disassociation. While the flower pot is empty, have your child decorate the pot with their favorite positive words and symbols using the markers and pens. Once they have their decoration complete, pour the potting soil into the pot and plant the seeds to the packet specifications. Watch your plant flourish in all of the positive energy. Print “Thank You!” on the inside of the blank cards using a laser printer. Encourage your child to creatively decorate the front of the cards and decide who they want to thank. This craft does not need to be done only when your child receives a gift; it can be an extra special reminder for a friend or family member that you child is thankful for their company and love.